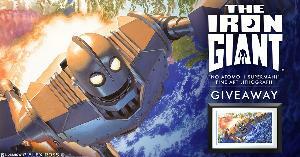 Prize: Iron Giant: “No Atomo, I Superman!” Framed Fine Art Lithograph by Alex Ross. What you must do to enter: complete form - winner pays shipping. Statistics: This contest was opened by 134 and entered by 8 ContestChest.com members. 6% of those who opened the contest, entered it.